Posted March 27, 2018, in MPA and EMPA Student Testimonials, MPA Testimonial. What made the MPA degree at Rutgers–Camden the right program for you? 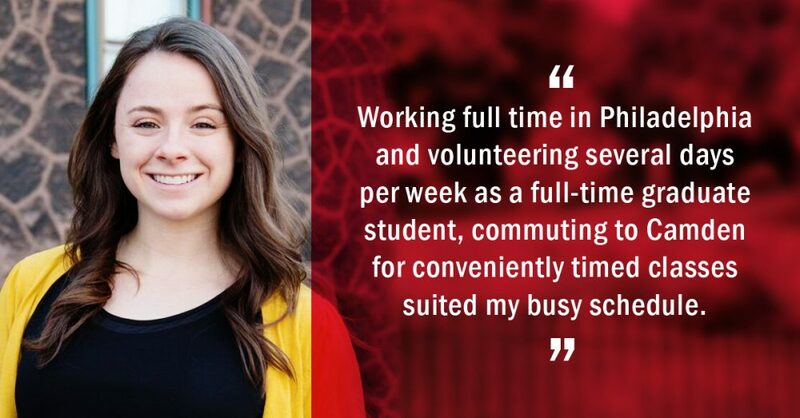 Logistically, the program at Rutgers-Camden was a perfect fit. Working full time in Philadelphia and volunteering several days per week as a full-time graduate student, commuting to Camden for conveniently timed classes suited my busy schedule. The location of campus also added an additional layer of richness to the curriculum. Theory application and case studies analyzed in class were often compared to what was going on in Camden at the time, keeping conversations interesting, relevant and applicable. How do you feel this program helps to prepare you for your future? Students were encouraged to relate what was being taught in class to their personal projects, internships or current career. This produced an environment of real-time learning and the chance to identify necessary areas of growth. In other classes, specifically those for my specialization, taught utilizable skills, a toolkit that will be applicable throughout my future as both a citizen and a worker. What about the program did you find the most beneficial/rewarding in your career? One of the most important experiences during the MPA program was the internship placement. I fortunately had several opportunities to apply skills which I had learned in the classroom into practice. Most importantly, I loved the small class sizes and constant open conversation, a type of learning environment in which I thrived better than I had in my undergraduate career. Impassioned class discussions and lively debates were commonplace, and I learned immeasurably from my peers for whom I am thankful. What else would you like to share about the degree program? Being a part of the MPA program was a real privilege. Interactive classes gave way to forging intimate bonds with fellow students and professors and staff, yielding a positive atmosphere in which participants assisted one another in mutual growth. Page last updated by Department of Public Policy and Administration at 8:32 am October 24, 2018 . This page was printed from http://dppa.camden.rutgers.edu/2018/03/27/moira-cahill-17-mpa-of-comunity-development/ at 6:14 PM Tuesday, April 23, 2019.